Our adult tennis programs offer something for everyone. Beginner sessions are a no pressure way to start tennis with other adults just like you who may have never picked up a racquet or have played only a few times before. Intermediate Drills are geared towards adults who have played before and want to improve their skills or simply practice hitting lots of tennis balls. Contact us now for more information or to sign up. 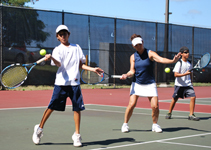 Please contact us if you have any questions about our adult tennis programs.